Stay safe during Sandy, everyone! Let’s hope there’s a rainbow at the end of this storm. Gluekit’s illustration for Newsweek “Yes We Cain!” cover featured on Meet the Press. Jean Jullien’s sweet summer goblin cover for the Yale University Art Gallery 2009 Calendar! Jean is a mega-talented London-based illustrator & designer who has a penchant for cuddly characters, costumes, and cut paper. His three-dimensional cover for Victionary’s 2008 Stereographics: Graphics in New Dimensions caught the eyes of the design world, and he’s since finished a number of projects and produced new exhibition work that explores an expanding galaxy of characters and his own playful visual language. Jullien gradated from Central Saint Martins just last year and is now studying at the Royal College of Art while continuing to produce a steady stream of colorful commerical work for clients like Print Magazine and The Guardian. We are thrilled to announce that the judges of TDC 55 selected Gluekit’s cover for the Print Regional Design Annual for typographic excellence! It will be featured in the annual Type Directors Club Exhibition for 2008 and Typography 30. Gluekit’s illustration of some of the iconic figures in the Condé Nast empire– Anna Wintour, Graydon Carter and publisher Si Newhouse— for the cover of New York Magazine! The article is here. Michelle Shines on New York! Last week we created the Michelle Obama illustration which graced the cover of New York magazine. Drawing inspiration from a wide array of sources, including Andy Warhol’s brilliant mid-1980s Interview covers (glamour! kitsch! mood lighting! ), we were so happy with the way this turned out. During our work on the Print Magazine 2008 Regional Design Annual cover and interior spreads (!! ), we generated hundreds of photographs documenting our approach and process for creating three-dimensional typographic scenes. Some of these images we loved for their simplicity–others for their spatial oddness, color play, or because of the exact moment they captured. This one? Well, we love drips crawling down a white wall. Drips and splatters do feature prominently in much of our work– tactile and messy and nearly always evidence of the process at hand. And in this photo you can also spot some of the stage markings we used to indicate placement for objects. In order to create some of the visual effects on the cover, we needed to calculate the right angle and position for the various components using a whole host of techniques. Recent Gluekit work: a cover illustration for the UK Guardian’s Guide! Their cover series features some really great work, and we were super happy to join their happy ranks. This issue was published a few weeks ago; it’s a nice poppy end of the year crunch to 2008, chock full of plenty of memorable celebrities and characters. It’s always a treat to see what’s on the end of year countdowns. Brrr, that’s a chilly stare! Gluekit is very happy to have illustrated the November 24, 2008 Newsweek cover of Obama and Lincoln! New York Fall Preview Cover! Gluekit is thrilled to have illustrated the 2008 Fall Preview issue of New York magazine, which features forty-seven individual illustrations. We had a great time working on this, guided by the smart folks at New York. Hurrah! Hot off the presses! We are supremely excited and thrilled to have created this week’s Newsweek cover! It was a terrific experience, especially since we were guided in our work by thoughtful and precise art direction. A good dollop of humor goes a long way, especially when accompanied by a clear and articulated concept– collaboration heaven! And for our international friends, we also did the overseas cover, which features the world’s most popular unpopular leaders. So, happily, this week we can say we’ve got everyone covered! Gluekit recently designed the cover for the 200th anniversary of the fabulous Greek film magazine Cinema. This was the first typographic cover we’ve been asked to create, and it was an absolute blast! Here at Gluekit, we’ve been really thrilled to start working with a film culture magazine in Greece. They’ve been great to work with, and this cover opportunity was super fun. The issue itself focuses on Ingmar Bergman’s legacy, and the art directors wanted to make him look modern to highlight his ongoing influence on European cinema. The color palette draws on the colors in Sweden’s flag, in homage to Bergman’s roots. The March 22 issue of Billboard features a cover illustration by Gluekit! The cover story is about how country music biz is going digital, bit by byte. 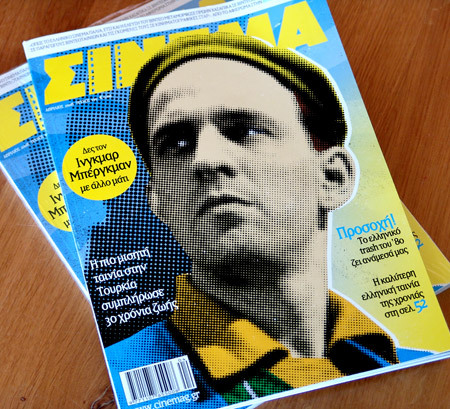 We were excited when one of our illustrations was used as the cover of Greek film magazine Cinema. The piece was originally created for Entertainment Weekly, and then picked up in Greece. Here’s a snapshot of Daniel Day Lewis with the cover at a recent film festival. Here’s a sketch Gluekit created for a recent cover of Ode, a Dutch magazine that began publishing in the United State a few years ago and focuses on news about positive actions being taken around the world. The idea was to create a central Gandhi figure in the foreground and fill the background with celebs following in his footsteps and a raucous crowd of supporters. Gluekit loves covers and the thrill of possibilities.